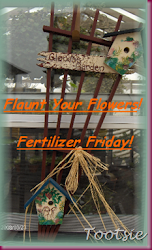 It's Fertilizer Friday over at Tootsie's again, and there are a whole bunch of gardeners showing off their beautiful blooms, so don't miss the opportunity to see green, growing, flowering plants on the other blogs. Unfortunately, you're not going to find any of that stuff here, but Tootsie generously lets me slip by with my last few week's offerings. (She's so kind!) Just click on the Fertilizer Friday link on my sidebar. This is our campfire area...we had one on Saturday. Fantastic snowbanks, this one is over 5' tall. The Girls turn their back on the scene. What is the meaning of this?? 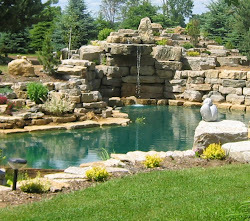 The pond is coming up--that means the water table is on the rise. Looks like we could go ice skating, doesn't it? Ah, but looks are deceiving; maybe we could go skinny-dipping with ice bergs if you're into that sort of thing. I'm not into such indecent things and our neighbors are eternally grateful. There are handy twigs to hang your clothes on though. Ok, my excuse is Spring Fever, get me to a doctor. On second thought, no, NO doctors! You all know what my track record with the medical profession is like. The tree, that is, not me. (No need for a doctor.) I did break my wrist once, about ten years ago. Talk about stupid....it was the last week in March and my dog was barking one night, so I went out to see what the problem was. I went and got my trusty Cow Flashlight, Rosalie. Yes, Carl bought me Rosalie for my birthday ten years ago. What Farm Girl wouldn't want one? She is named after the first cow I ever owned. I cautiously tiptoed around the side of the house, looking for whatever was driving Teddy dog to bark like a maniac. And yes, like all bad horror flicks, I went alone. Why do they split up in horror movies? Everyone knows what happens to the first person who goes alone. They are always extras and they don't come back. Alive, that is. There were no Bad Guys; but there were some raccoon hunters unloading their dogs on the road just past our house that were driving Teddy nuts. But Something did get me. It was was a teeny, tiny patch of ice left from winter on one of our stone staircases--I swear the patch was less than 6" x 6" and the Official Last Patch of Ice left in the State of Wisconsin in 2001. I tiptoed unaware onto the ice and ended up doing a series of acrobatic moves rivaling anything in the Olympics causing me to fling poor Rosalie straight up into the air. Yes, Cows can fly. Rosalie was none the worse for wear. But I had a broken wrist. And I had to explain to a bemused ER doctor how I came to have a broken wrist on the last day of March. And I had to wear a cast for six weeks. A hard blue cast on my right wrist. And I am right-handed. I had to learn to do everything (eat, write checks, use the ah, restroom facilities, etc. with one hand, my left one. And it was awful. The cast, that is. I dislike casts, don't recommend them. No fun. I am a bit ambidextrous now, though. Rosalie and I don't venture out looking for ice in March any more. And when Teddy barks at night, I send him to bed. So, here it is, the first week of Spring, and we are cleaning up after a major snowstorm again. Ah, Wisconsin. Gotta love it or go stark raving mad. Dave's car, stuck in the driveway this morning, March 23. I choose to love it. One thing about Spring around here, it is always unpredictable. This past Saturday we hit temps in the upper 40's which is what passes for balmy temperatures for us. Ann stopped in for a visit and wanted to know if we felt like working outside since it was such a nice day. There were just a few snowbanks left from winter, but the rest of the garden was defrosted, so off to work we went. In the video above, Ann sets fire to a big clump of 'Heavy Metal' panicum which burns at a moderate rate. (The video quit before the grass burned down entirely.) On the other hand, calamagrostis 'Karl Foerster' goes up like a rocket; nothing burns faster. It's a good idea to have a hose handy if it's dry out before we break out the cigarette lighter, and any grass too close to a building or a tree would not be a good candidate either, obviously. One spring Joel and I were burning grasses down and the wind switched and turned a nearby Dwarf Alberta Spruce into a toasted marshmallow facsimile. Surprisingly, the tree recovered, they are tough. The same spot in the driveway, minus the Girls. They spent the day in their coop. This was the heaviest, wettest snow we have had all winter, and the trees are all hanging down. Though it's hard to see from this picture, the water in the Quarry is open and rising. The snow started falling Tuesday morning while I was out for my walk. It wasn't snow, actually, but more like sleety pellets bouncing off my noggin as I sped along as fast as I could. Dave had dropped me off about two miles from home on his way to tech school so I could walk with the wind at my back. Whenever we have a northeast wind as strong and damp as that wind felt, we're in for a lot of snow. The meteorologists were right again. All day long the snow started and stopped, but by last night around 10PM, it was getting serious about sticking around. The weathermen were also predicting 'Thundersnow' and by golly, they were right about that, too. We had a lot of lightning and thunder and I was running around the house unplugging all the computers and other electrical stuff we didn't want to see destroyed. It was quite the light show. So, I spent most of the day running the snow blower again. From 1:30 to 5:30 I was out trying to clear the snow off the driveway. Of course, I was almost done when the town plow came through and shoved the driveway shut again. Oh, well, I love to be outside. At least I had the snow removed enough so Carl and Joel could get their cars in the driveway when they got home from work. Sneaky Carl taking pictures of me again. One of these days, we'll have some real flowers to show. Junk + Whimsy....hey, it's Jimsy! Aluminum light shades from a dumpster. Lovely? Not really. This one was sitting on the ground because I didn't have a plant stand for it. We eventually found three wrought iron plant stands which were heavy enough to hold the weight of the light shade planters, but they tip over in heavy winds. When Carl came across some industrial equipment parts two years ago I didn't care what his plans for them were, I decided they would be my new plant stands. Once the flowers start to grow though, you can't tell what they are growing in or the pots are sitting on, so it doesn't matter all that much. You never know what's lurking under some pretty flowers, do you? With Carl's light shades, I can have some color along the driveway. Even sitting right on the ground, they work out pretty good. Moving on, here's a little wire basket Carl also found in the dumpster at work. With a little paint and a moss liner, we have another planter. Ok, he does bring home some good stuff once in awhile. For my birthday a few years ago, my father-in-law welded me up a watering can. Wait....what happened to the watering can? Well, before the impatiens grew so much, you could see what it was supposed to be....I guess I didn't plan ahead. Now it's a big, pink blob! There's a watering can in there somewhere. The next container isn't really whimsical, but I just have to add it. My father-in-law found this old planter in a junk yard ready to be sold for scrap over 30 years ago. He bought it for scrap metal price and brought it home and fixed it up. About 20 years ago, he gave it to us. I am so glad he did! Unfortunately, he was a few castings short for the stand, but someday we might find their match. Until then, it works just the way it is. I just cram a big container from a tree we bought in the top and plant a bunch of drooping stuff in it. Carl still eyeballs the old tool stand wistfully, he says when he finds a use for it, he'll be taking it back. That's what he thinks. The Management around here thinks differently. Thanks to Tootsie for a great idea for a post today. I'm so sick of looking at snow and mud here and the process of posting took my mind off the mess outside. Thanks also to Carl and his dad for their great welding expertise. My 53rd birthday was last week Thursday. No matter how you write it, the fact remains-- that's a big number. Anyway, Carl took the day off work to help me celebrate and we took a little drive which is one of our favorite pastimes. Another thing we love to do is prowl around in antique stores and we decided to stop in at our favorite shop to see what was new. Ok, not new, old---I mean, antique. Sorta like me. I spotted a stained glass transom window in the store and for some inexplicable reason, we bought it. I don't know why, really. It's not like we couldn't build this window if we wanted to. Compared to a lamp, the 125+ pieces wouldn't be a tremendous amount of work to recreate, but there was just something about the textured glass and the colors used in the window that we both liked. The window is in a wooden frame that has a quite a bit of dry rot in it, so a new frame is in order, but the glass itself has no breaks whatsoever, which is amazing. We had both walked away from the window and decided against it, but when I asked the owner if there was any room for negotiation on the price and he came down significantly, well, then it was a done deal. Back up the car, we're buying a window. Carl said, "I bet this window is old, maybe 50 years or more." Then he realized what he'd just said-- heck, we're both 53 already, so this window is likely a bit older than us. So, we brought home our new-old window and hung it in the living room. Neither of our sons were too taken with it; they said it's ok, but thought we could have built something better ourselves. Yeah, maybe we could have, but the old window just spoke to Carl and I. Us antiques have to stick together.